The 2 Amp Wall Charger plugs into any standard wall outlet via the included AC adapter, and its compact design means it is small enough to throw in a briefcase or backpack when you're on the go. This Adaptive charger has an output of 2 Amp to give your phone power at a much faster rate than your typical 1 Amp or 700mAh charger. Additionally, it comes packed with Adaptive Fast Charging technology that will charge fast charging devices with that feature built-in at an even faster rate! 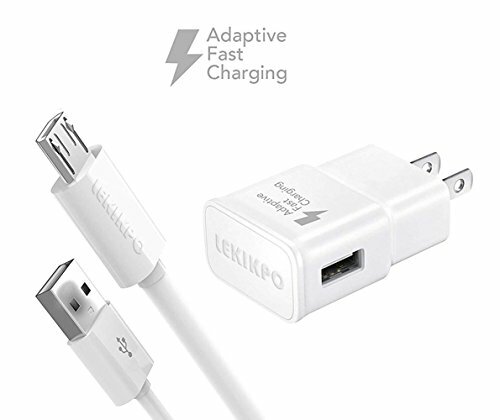 The Charger also comes with a detachable USB to Micro USB cable, which allows you to charge your phone from the USB port on your computer or other USB power source if you aren't near a wall outlet. You can also sync and transfer files between your computer and Galaxy smartphone or other phone using the Micro USB cable. Keep one at home and one in your bag to make sure that your phone is always ready to go when you are. Rapid implementation: Let us take Samsung S6 as an example. If you use a regular wall charger, you need to wait 2-3 hours, but using this quick charger takes only 1 hour, faster than ever, and you can get feedback and reviews from many customers. Fast Charge 2.0: Charge-compatible devices are up to 75% faster than standard chargers, truly saving your waiting time, and can work with non-fast-compatible smartphones or tablets at normal speeds (up to 5 volts/ 2 amps). Service: We guarantee 100% customer satisfaction. If you have any questions about the product, please feel free to contact us. We sincerely serve you. If you have any questions about this product by LEKIKPO, contact us by completing and submitting the form below. If you are looking for a specif part number, please include it with your message.